In case you are not aware, this past week has produced very impressive aurora due to the multiple magnetic storms rolling through our atmosphere. Some say it might be luck, some say it might be from the solstice; one thing's for sure, it makes for slow-moving mornings and lots and lots of coffee. I noticed the alerts pouring in and reports of an inbound solar storm all throughout the day on Monday. It seemed like everything was aligning for an evening of incredible proportions. We set off on the road to Kannata Valley, near Saskatchewan Beach, nestled beside Last Mountain Lake. We ran into a bit of rain and were faced with ominous billowing clouds that seemed to doubt the chances of us seeing clear skies that night. We continued on, the sun just having set behind the clouds but not yet the horizon. We ended up on the edge of the valley then hit some grids until we arrived beside a big blue blip on the map. We stopped because we were at a location with somewhat decent foreground, and because the water actually blocked us from going any farther. We unpacked and set up our gear. At this point, the sun was just setting giving a nice warm glow on the horizon. It wasn't quite dark enough at this point so we started to point the cameras at the moon, sitting comfortably to the west. I stopped down to get nice points with the bright light of the moon. After trying varying aperture values and/or shutter speeds, I noticed what looked like clouds coming into frame. We realized how wrong we were when we turned and looked to the south, the east, and then the north. Only one other time have I been caught off-guard by the northern lights. This time, they were stretched out, completely overhead, and literally over the moon. 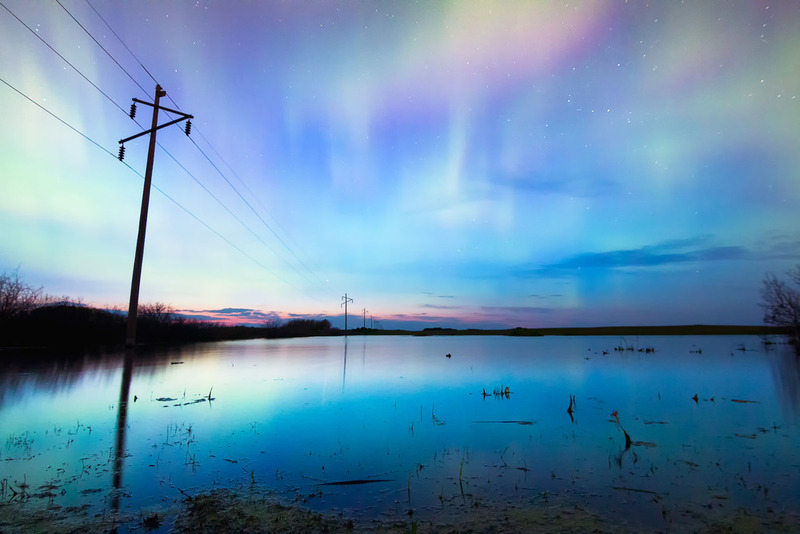 It's great the feeling you get when you realize you're in the middle of a solar storm; these lights that pulse and dance so quickly that you won't believe your eyes. Being able to share that feeling with others is even better. I'm glad to have been in the good company of Tashia, my girlfriend, and Herry, a fellow photo-enthusiast I connected with through Instagram. We stayed out for a few hours until it was well past my bedtime. I was hesitant to get out of bed the next day but with a steady supply of black gold, it was manageable. It's been a busy week and been processing photos that I'm happy to share with you. I have been using some different techniques, both with shooting, as well as post-processing. I wanted to see how I could get less noisy images, so I attempted some panoramic shots using my 35mm 1.4. On my journey through astrophotography, I came across LonelySpeck.com and took some pointers from Ian Norman. The biggest of which would be Google's Nik Collection, specifically DFine2. It's a great tool for eliminating noise and is very easy to use. I'm happy to say that I learned quite a few things in the last few days. Have questions? Great. Leave them in the comments. In case you missed it, here is a time lapse I created showcasing a small portion of our evening. If you know me, you'll know how much of a fanboy I am for Instagram, and 15 second videos.